Unreliable narrators may not be paragons of honesty, but they are delicious fun to read. Suzanne Rindell has written one of the most interesting (and least trustworthy) narrators I've read in some time. Rose Baker is a rather buttoned-up, rule-following typist at a police precinct in New York City in 1924. Or at least she appears that way at the beginning of the book. Her job recording and transcribing criminal interrogations exposes her to a side of city life in which most proper young ladies have no business, but that's about as exciting as her life gets. She does her typing and filing each day and returns home to a squalid boarding house where she shares a room with a gossipy woman named Helen. Her life is predictable, safe, and boring. Until Odalie—the other typist—is hired on at the precinct. Rose is immediately transfixed by Odalie, even though she tries not to seem impressed by her attractive clothes and bubbly charm. Rose begins taking notes on Odalie's daily habits, a weirdly obsessive journal that she keeps in her desk. This is just one of many red flags that make us wonder if Rose is entirely in her right mind. Odalie and Rose form a friendship that grows progressively tighter and more enveloping. Soon Rose has abandoned her room at the boarding house to live with Odalie in a posh, glitzy hotel. Rose has never had much money before, but Odalie always seems to have easy access to luxuries even though she never seems to pay for anything. Odalie's wealth is mysterious, and by all rights Rose should have a lot of questions for her, but she's so smitten by her and so flattered to be chosen as her “bosom friend” that she quells her unease and blithely goes along with whatever Odalie suggests. The friendship between these two women is a twisted web, and it becomes obvious through Rose's telling that they are headed for a devastating collision. Who exactly is Odalie, and which of the many versions she tells of her past is true? And eventually we have to ask, who is Rose, and what, if anything, can we believe about her version of this story? Rindell isn't going to provide straightforward answers for any of those questions. She leaves us guessing until the very last page, and even then the revelation is so subtle that the ending is veiled in ambiguity. If you can't deal with books that end on an equivocal note, this one will likely frustrate you. 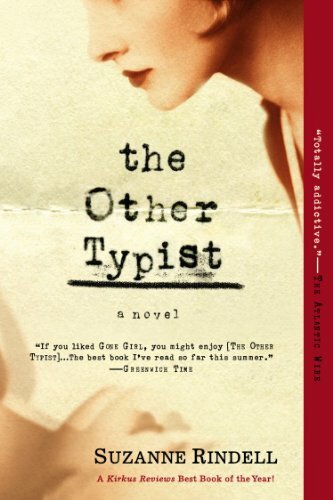 However, if you want a book that will squirm its way into your brain and take root there, if you enjoy mulling over details and trying to puzzle out a way to fit them all together, you will love The Other Typist. If you can't get enough of unreliable narrators, click here for other titles I've recommended in the past.